We are now excited to offer Family Climbs in conjunction with Family Swims! 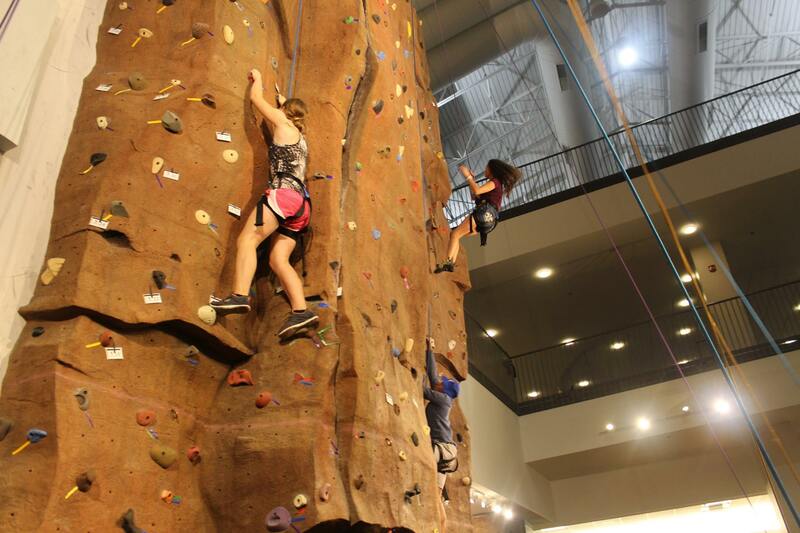 Family Climbs are held in the Student Fitness Center at their rock wall. Please note that in order to participate, children must securely fit in Campus Recreation’s harness or bring a harness to be approved for use by Campus Recreation staff. Parents/guardians are required to remain in the area while children climb. Campus Recreation staff and adaptive equipment will be available to provide assistance. If participants are unsure of what accommodations they may need, please contact Andrew via email at amorrea@ilstu.edu with any questions and to request specific accommodations. Accommodations such as sign language interpreters or FM Systems may also be available upon request. Crates for service animals and ADA locker rooms are available near the Climbing Wall area. For specific questions, please contact Andrew at amorrea@ilstu.edu. This is a free event, but registration is required. Please register to attend via the online registration system. For a complete list of climbing wall policies, please visit http://campusrecreation.illinoisstate.edu/about/policies/sfc/index.php?id=1&tabID=tabs-accord2.